This commission involved the hoardings surrounding a building site in the Docks. The architectural identity of the docks is stark, consisting of rectangular brick warehouses with rectangular windows. This is accentuated by the orthogonal plan of the Docks encompassing land and water. This commission symbolises these qualities. Red lights that switch on/off abruptly, representing the lights in the windows of the warehouses. In contrast, the blue lights represent their reflections in the water, and consequently are more subtle, having a gentle rise and fade. 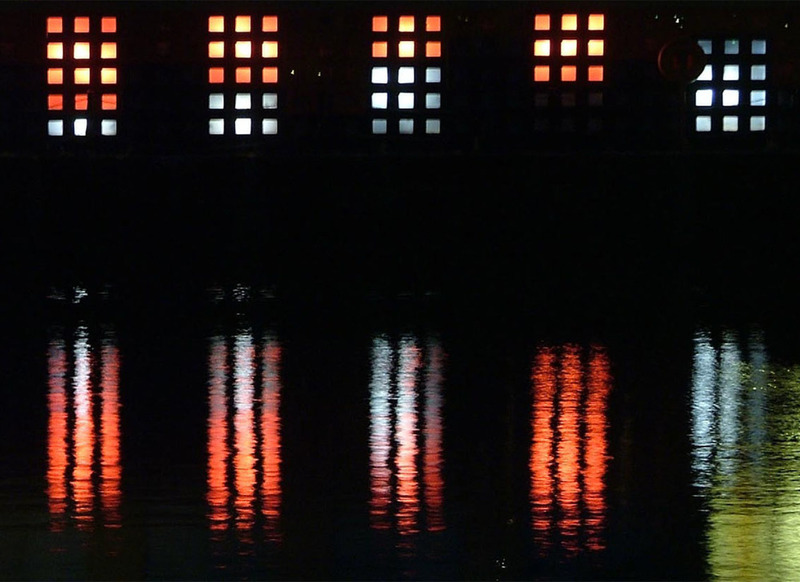 There were 34 panels, each with fifteen square apertures illuminated from behind by artificial light. These are interspersed at appropriate locations within the surrounding hoardings.